Light is very sensible to the materials wherewith it interacts, as we exploit looking to the best materials for photonic integrated circuit. But, looking in another way, photonics chip can be one of the best sensing platforms for detecting very small changes in the material. We’re exploring this possibility by developing, design and testing biosensor, made with photonic chip, for the detection of small quantities of target molecules. The mode of a waveguide is not restricted to its core, but it has also an important interaction with the outside world. Such interaction is exploited by removing the upper cladding material, exposing the waveguide core, and then deposit a thin biochemical layer over it. This “functionalization” is formed by anti-gen or antibody able to capture and hold the corresponding gen or protein, without interact with other molecules or substance. For the optical field, this binding appears as a change in the refractive index that corresponds to a change in the propagation parameters of the light. 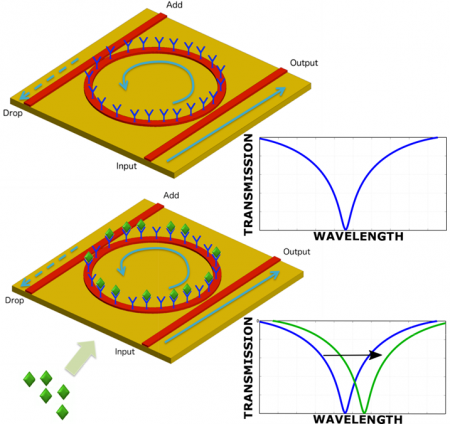 This is the basic but powerful concept behind photonic biosensors. To push towards this concept, high quality resonant cavities are used as main photonic sensor: with this devices, changes in the refractive index shift the resonant frequency of the cavity, andt the analyte detection is easier and more direct to perform. Thanks to years experience in resonant cavity of our group, the design of photonic circuits for biosensing is fast and accurate; in particular we use ring resonator, one of the main photonic devices, easy to design and fabricate. Moreover, high quality resonant cavities allow to push the detection limit of our sensors down to nM or even pM. We also study advanced techniques to interrogate such type of biosensor in other to reach even further small limit, for example by using digital post-processing or dithering the laser wavelength. Collaboration with spintronics group inside POLIFAB permits us also to use magnetic-label technology to boost further our detection limit. The final goal for this technology is the development of a lab-on-a-chip, a chip that integrates different types of biochemical tests, without the necessity of having complex system, labelling steps or high skilled staff; moreover such sensors can be carried around or placed in “point-of-care” places. In different European Projects we are carrying out our experiments, we have a collaboration with EDA (European Defence Agency) for protein and bacteria detection; also we are developing DNA sensor for early stage cancer detection, in collaboration with important industrial and academic partners.